Alice Springs is a city located in the Northern Territories of Australia. 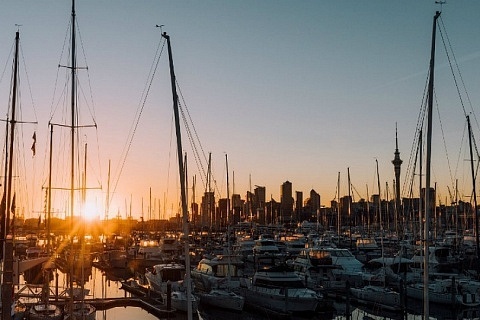 It is the third largest city in this region, and one of the most important inner cities in the country. Alice Springs is located near the southern border of North Australia, in the heart of the country, and in the middle of Australia’s great central desert. Its isolation is, however, subjective. Alice Springs is one of the most important tourist centres in Australia due to its proximity to some of the most spectacular National Parks in the country, such as Ayers Rock (Uluru). Its equidistance from all the major Australian cities (which are mostly located on the coast) also makes Alice Springs an important city of fairs and congresses within Australia. Alice Springs is a small city, perfectly walkable in its urban area. The tourist attractions of Alice Springs are closely related to nature. 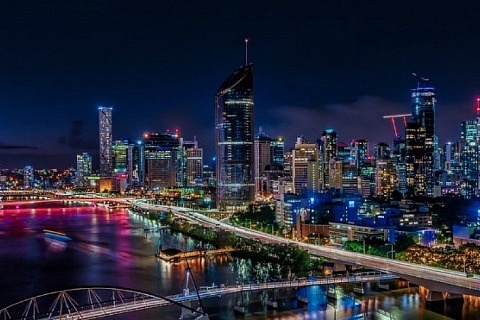 The main attractions of the city include the Desert Park, the Reptile Center, the Botanical Garden or the nearby Larapinta Trail. Nearby natural parks include the imposing Uluru Monolith, Alice Springs Desert Park, the West MacDonnell and Finke Gorge National Parks or the Owen Springs Nature Reserve. If you want to make the most of your stay, the Alice Springs City Centre, sometimes abbreviated CBD, is the best area to stay in Alice Springs given its proximity to urban tourist attractions (See accommodation in Alice Springs’ CBD). Here’s a guide with the best areas to stay in Alice Springs, Australia. Alice Springs’ Central Business District or CBD is, as its name suggests, the heart of the city and one of the best areas to stay in Alice Springs. Alice Springs’s City Centre is known for its grid streets, low-rise buildings, shops, and restaurants with outdoor terraces. 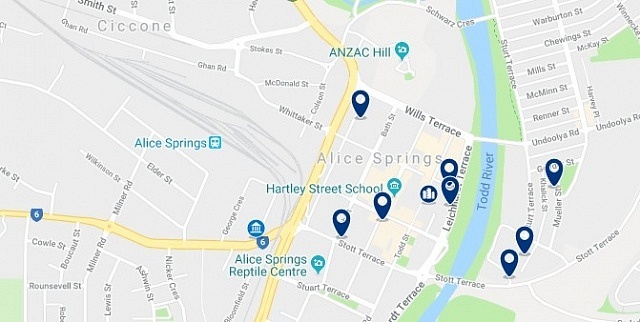 It is the oldest part of Alice Springs and includes many of the important institutions and places of the city, such as ANZAC Hill, the Reptile House, the Adelaide House Museum, the Totem Theatre or the Alice Plaza Shopping Centre. 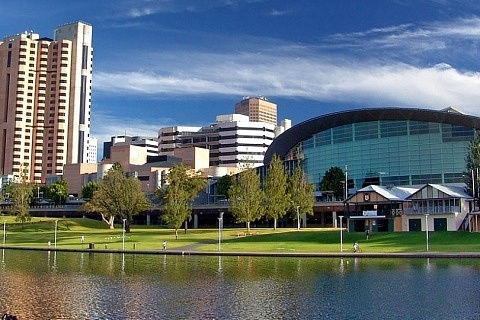 The CBD is also located next to the city’s train station, which, although lacking frequent passenger services, offers weekly connections from The Ghan, a train that runs Australia from north to south, from Adelaide to Darwin. The City Centre is also the best area to hire an organized tour to Uluru National Park, located just over 5 hours south of the city. Alice Springs City Centre has the largest hotel offer in the city, from backpacker options to luxury hotels. Elkira Court Motel is located in the centre of Alice Springs and offers air-conditioned rooms with a refrigerator. It has an outdoor pool and barbecue facilities. Elkira Motel is 15 minutes’ drive from Alice Springs Airport. Alice Lodge Backpackers has a fully equipped shared kitchen, barbecue facilities, a lounge with a TV and access to a shared laundry. It also includes a safe and free luggage storage. This 4-star hotel offers free Wi-Fi, parking and modern accommodation close to the CBD, Alice Springs Convention Center and Lasseters Casino. The area of Desert Springs is located south of the city of Alice Springs. It is a quieter area than the centre of the city, but it has several accommodation options. This area of Alice Springs has some of the attractions of the Australian city, such as its Botanical Garden, a golf course or the Convention Centre of the city. The Alice Springs Convention Centre, which has state-of-the-art facilities, has been, since its inauguration in 2002, the venue for small meetings, intimate dinners, and national and international conventions. 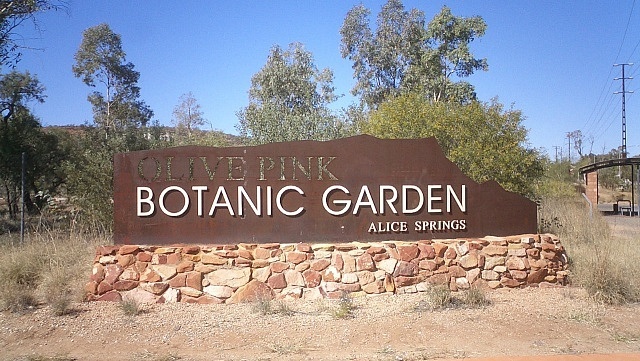 The Olive Pink Botanical Gardens of Alice Springs specializes in plants from the arid areas of Australia. 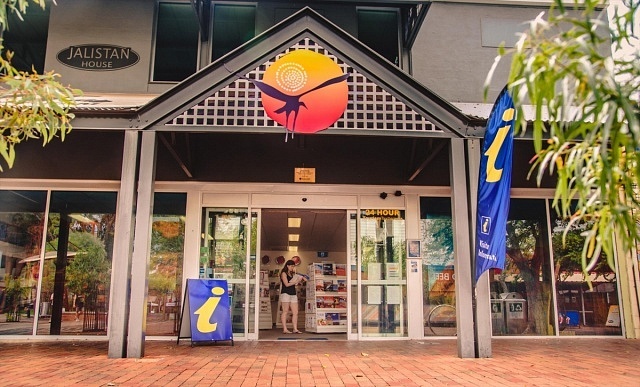 The proximity to the Alice Springs Convention Centre makes Desert Springs one of the best areas to stay in Alice Springs for business travellers. Between the Todd River and the Alice Springs Golf Club, and with the MacDonnell Ranges as a backdrop, the DoubleTree by Hilton Alice Springs is a luxury resort awarded for its environmentally friendly innovations.